Ben & Mat AKA. Lyon & Lyon expertly walking us through the process of delivering on your imagination. 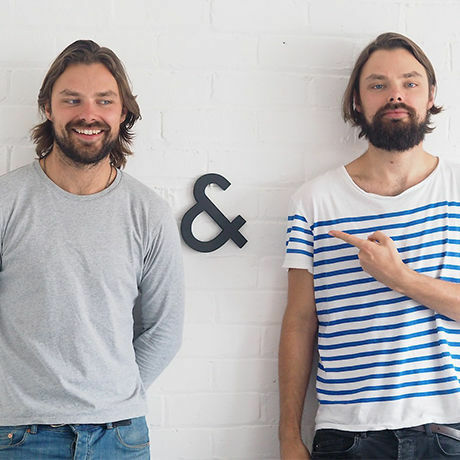 Ben&Mat Lyon are a highly talented pair who head up their own brand & design agency Lyon&Lyon link. After leaving Sheffield Hallam back in the day, they initially went separate ways. Mat headed to London to make it in product design and Ben started a new direction in interior design. After 8 years apart they combined forces, moved back to Sheffield and started Lyon&Lyon on their 30th birthday. Whilst now based back in Sheffield their work spans much further afield. From tech start-ups in San Fransisco to innovative high-end jewellery designers in Paris. With many clients also in London, they recently opened a spot at Makerversity in Somerset House link (made possible by fellow CreativeMornings/Sheffield member and previous speaker Tom Tobia AKA. Mr Makerversity link ). Ideas and people are at the forefront of their creative process. They gained notoriety early on with their ‘Six Mile Pencil’. What started as Kickstarter campaign link went on to be produced, shipped worldwide and winning awards link and press as it went. A self-initiated project to reconnect to the skill of sketching and idea forming away from the computer. The Six Mile Pencil captured people’s imaginations: ‘The Six Mile Pencil indicates how far you’ve drawn and contains 6 miles of graphite. Draw more, create more, let your thoughts travel.’ A simple idea that built into a story and a product that physically demonstrated their ethos. It got them into press such as WIRED and even to be invited to an exclusive WIRED event with fellow guests such as Will.I.Am. A real case of our favourite quote: ‘Do what you want to do more of’ with this opening such doors as a successful few years creating with Urban Outfitters. Their Sheffield home at Roco Creative Coop link embraces their collaborative ethic. In their studio they bring people together to collaborate, share ideas and to have a beer with. The building of a creative family. Recently expanding their team to include the immensely talented illustators, designers and idea generators Stephanie Hardy link and Alexis Jamet link. Also sharing the space as close collaborators are Johnny Wan link, George Law link (both with their own impressive list of top international clients, represented in NYC) and the influential Ben Duong link, who as Ben & Mat say: ‘a pleasure having people like that in the room’. So come hear it from these guys. How to get a great idea and how to get your mind in the right place. For creative thinkers everywhere. IDEAS & BEYOND by Lyon & Lyon. Hosted back at the awesome Roco Creative Coop with that coffee and those donuts. See you there!